The DLNR Division of State Parks has decided to keep all Hawai’i island park units open on Tuesday, Sept. 11, based on the current track of tropical storm Olivia. 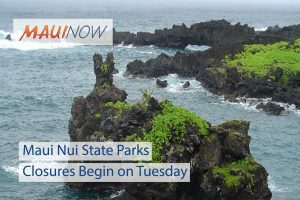 Early park closures on Maui (outlined below) remain in place, including the noon closure of Waiʻānapanapa State Park on Tuesday, Sept. 11, 2018, and the closure of other Maui Nui lands at their regular closing times. All Hawai‘i island and Maui Nui lands under the jurisdiction of the DLNR Division of Forestry and Wildlife are closing at noon on Tuesday, Sept. 11, 2018. The closures are in advance of Hurricane Olivia which is approaching Hawai‘i now. All state small boat harbors, operated by the DLNR Division of Boating and Ocean Recreation will remain open during the storm and provide safe harbor for small vessels. Additional forest lands and parks on O‘ahu and Kaua‘i may be closed as the trajectory of Hurricane Oliva becomes clearer. DLNR will provide updates through the news media and via the DLNR website  and on the DLNR Facebook page.